President-elect Rodrigo Duterte has offered the top post at the Department of Environment and Natural Resources to Gina Lopez of the ABS-CBN Foundation. Duterte's camp said in a statement on Monday that the incoming president made the offer during the courtesy call of Lopez, chairperson of the ABS-CBN Lingkod Kapamilya Foundation, at the Presidential Guest House in DPWH Panacan Depot, Davao City. Duterte announced that he offered Lopez the position as Environment Secretary at 6:15 p.m., just less than an hour during her visit. 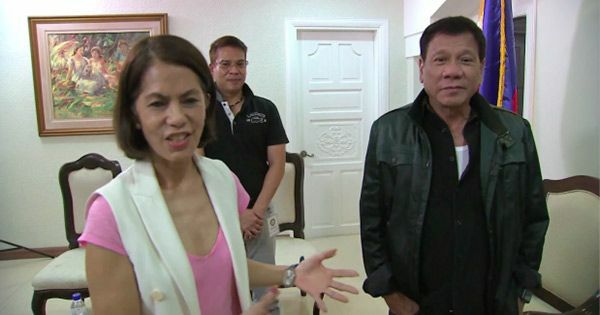 "I offered the position of the DENR to Ms. Gina Lopez," said Duterte in a video released by Radio TV Malacañang (RTVM), the official presidential videographer. Lopez was with him during the announcement. "I am honored with the trust given, this proposal, and I will seriously, seriously consider it," she said. During the campaign period, Lopez endorsed Duterte when she was invited to speak at the PMAP Summit on Clean Air and Climate Change held in Sofitel Philippines Plaza Manila last April. The ABS-CBN Foundation executive, who is known for her environmental and anti-mining advocacies, has yet to announce whether she accepted or refused the offer (update: Lopez has accepted the offer on Tuesday). Duterte considers the top DENR post as one of the most crucial positions in his Cabinet, as he vows to end irresponsible mining in the country. The incoming President previously promised to give the DENR post to a nominee of the Leftist movement. It's been said that Bayan Muna Representative Carlos Isagani Zarate was the progressive Left's choice for the position. However, Duterte changed his mind due to some sensitive mining issues.